Since it has to do with something that I like to read or someone else favourite book. What I love is definitely Scrapbook and craft magazine, but I hardly take picture of them and I hardly get a nice picture of myself reading, so I might as well do a LO on my son. Just recently little Mer were bugging me to get him a colouring book, ‘cos he saw Cal was coloring his book given by the school. So I got him this colouring book that also teaches him alphabet. He loves it! He keeps on showing me that he can read or rather he can tell what is in picture. This scallop cardstock had been staying in my stash for quite some times, I got it from Scrap-n-Crop too. As for the pattern paper, I still have some left from Coconut Scrapshop July kit and I’ve used the grungde alphabet that came together in the kit for the word “FAV”. “Book” word is from Basic Grey letter sticker. The stamp is from Hot Off the Press. 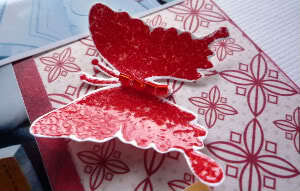 My embossed butterflies wtih beats.